Horsethief Lake State Park, Dallesport, WA. The Columbia Hills State Park (which includes the Horsethief Lake State Park and Dalles Mountain Ranch area) is a 3,338-acre camping park with 7,500 feet of freshwater shoreline on the Columbia River. Some of the oldest pictographs in the northwest are found in the park. Well known petroglyph "She Who Watches" and other significant Native American cultural resources are located at Horsethief Lake State Park. Guided tours are available in the Spring and Fall. On October 24, 1805, the Corps of Discovery arrived near present day Horsethief Lake State Park and encamped with the Wishram-Wasco village. The area was an Indian campground for centuries, with the Wishram, Cloud, and Lishkam fishing with nets and spears between The Dalles and Celilo Falls. Site was formerly largest burial ground of Indians in the area. 41. Columbia Gorge Discovery Center: Includes the Wasco Country Historical Museum. Lewis & Clark Exhibits and outdoor trail. 42. Rock Fort Campsite: The Corps established a defensive position here on both the outbound and return journeys. Interpretive signs. 43. Dalles Murals: At several locations in the downtown area, large murals depict Lewis & Clark's arrival and the Indian trading center at Celilo. 44. Horsethief Lake State Park: Here the Corps camped after running the "Narrows" and visited an Indian village where Clark counted 20 wooden houses. 45. 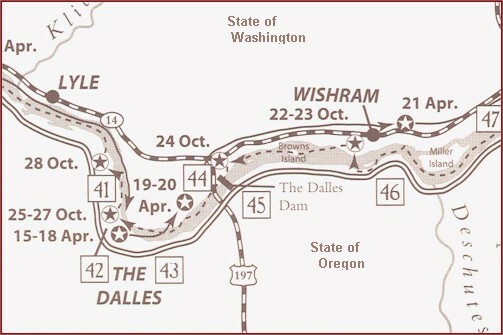 The Dalles Dam: This area was the center of trade for tribes from the Plains to the Pacific. Visitor Center and guided tour train. 46.Celilo Park: The Corps portaged around these great falls, now under water. Interpretive signs. 47. Maryhill Museum of Art: Exhibits include Indian baskets and stone tools. Overlooks Columbia River. Welcome to America's # 1 Choice for Lewis and Clark History, Travel & Shopping! LEWISANDCLARKTRAIL.COM AS FEATURED ON : CNBC, TIME, HARLEY DAVIDSON HOG MAGAZINE, FOOD CHANNEL NETWORK, AAA TRAVEL, GROUP TRAVEL LEADER, and NUMEROUS NEWSPAPER PUBLICATIONS ACROSS AMERICA!